Celebrate the 10th Annual World Circus Day Somers Art Circus, which is being organized as part of Somers Historical Society's World Circus Day Celebration, at the Elephant Hotel. Festivities include the Elephant Hotel debut of the musical duo Sons of Hachaliah Bailey, talks by playwright Frank Billingsley and poet Jo Pitkin, all Somers natives, museum tours and a children's parade of circus animals. 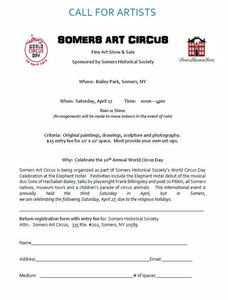 The Society is also looking for artists to display their work at the Somers Art Circus (Art Show and Sale) being held in Bailey Park on Saturday April 27th from noon until 4 pm. They are looking for original Paintings, drawings, sculptures and photorapghy. There is a $25 entry fee for a 10’ by 10’ space. The event will be held rain or shine and there are arrangements for the event to be moved indoors in case on inclement weather that day. Artists must set up their own space. This intenational event is annually held the third Saturday in April, but in Somers, they are celebrating the following Saturday, April 27, due to the religious holidays on the third weekend. For more information contact Somers Historical Society Attn. : Somers Art Circus, 335 Rte. #202, Somers, NY or call 914-277-4977. The accompanying photo also has a registration form for artists to register for the event. Click on the photo and download it, then print it.